Hi everyone, Chris here – I hope you’re well. So, it’s been 3 months already…That’s certainly flown by! 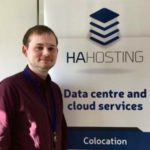 It’s hard to believe that it was 3 months ago that I was writing about how I had just started and what I was going to be up to here at HA Hosting. Since then I think it’ safe to say I’ve fit right in with the rest of the HA Team. It’s been a warm welcome and I’ve enjoyed (an am enjoying) working on all things digital marketing for us. I’ve not got too much to say here really. So here are a few highlights in terms of projects/things we’ve implemented here at HA Hosting, that you may (or may not) have noticed us doing. That’s about all I’ve got to say for a quick little update like this. I’m looking forward to the coming months and projects we’ve got lined up, and hopefully so are you. I’m sure you’ll be hearing from me again soon enough on here and in the meantime, you can catch me on HA Hosting’s social media channels. Chances are you’re probably speaking to me if it’s over social media. ← #6 Is Your Office 365 Data Safe?